This workshop will be presented by Lalor O’Shea McQuillan Chartered Accountants. PAYE Modernisation is bringing sweeping changes to how employers gather and report information on pay and statutory deductions to Revenue. 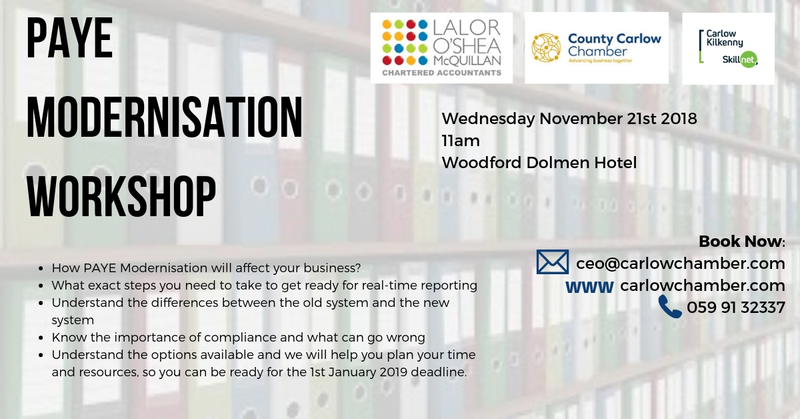 In this workshop, Lalor O’Shea McQuillan will focus on a number of critical areas to help your business prepare for the 1st January 2019 deadline. We will give you an overview of the options available and help you plan your time and resources, so you can be ready for the 1st January 2019 deadline. Time is available at the end of the Presentation for business owners to speak directly with the Partners and Payroll Managers. Places are strictly limited and early booking is advised.